Wool Ewe Be Mine Club Starting Thursday, July 18, we step up to the plate and battle it out against the Atlanta Raves (Suzanne's Quilt Shop) in the first game of the 2013 Major League Quilting season. And, we need your help! 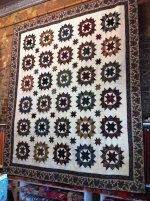 All you have to do to participate is vote for your favorite team (us, of course) and help our quilt move on to the next round of tournament play. One vote acts as one run. So, just like in baseball, the team with the most runs wins the game. Vist our team page here and register here. See More We are excited that Paula Barnes is offering two workshops at the shop July 19-21. She'll be teaching Regimental Star on Thursday and Friday. On Saturday and Sunday, she's teaching Star Of The West (pictured). Both classes are $150 each and we also have kits available for each class. You have to stop by the shop and see her Star of the West. It's gorgeous! The Regimental Star will be in the shop soon. Calling all HIQ Divas - your next project is going to be the Pyramids block on Page 31 of your History Repeated book. You'll need to make 100 peiced blocks (just the pyramids, not the solid pyramid blocks) using reproduction fabrics to exchange on Friday, October 4. Oh, and guess who's going to be at the shop that day? Ms. Diva herself, Betsy Chutchian. We have the Creative Grid 60 degree triangle ruler to help make these blocks come together quickly. We're still accepting Divas. If you'd like to join our group just email us to find out more. History Girls! It's History In The Making! The first meeting is this Saturday, July 13, at 6 p.m. Each month we will work on two intermediate blocks and have one challenge block. Bring your machine and some fabric from your stash to learn how to piece these blocks together. At the meeting, we will discuss fabric selection such as period fabrics or fabrics that suit your flair. There will be prizes for those who complete their blocks each month. We can do it! Sign up now.